Toronto – December 1, 2017 – December 6 marks the National Day of Remembrance and Action on Violence Against Women. The date commemorates the 14 women who lost their lives due to gender-based violence on December 6, 1989 at L’Ecole Polytechnique in Montreal. It is also an opportunity for activists to come together and re-affirm our commitment to supporting actions aimed at confronting gender-based violence in our communities. This tragic moment in history could have happened anywhere in the country. Half of all women in Canada over the age of 16 have experienced at least one incident of physical or sexual violence. While federal mechanisms are now in place to address a national housing and gender-based violence strategy, the amount of funding allocated to eradicating violence against women in communities across the country is still not enough. That is one reason why UFCW Canada supports the work of Women’s Shelters Canada, the only national organization that brings together a collective voice of women’s shelters across the country. Actions speak louder than words in ending violence against women, so we must be steadfast in acting to eliminate violence against women in the workplace and in communities across Canada. 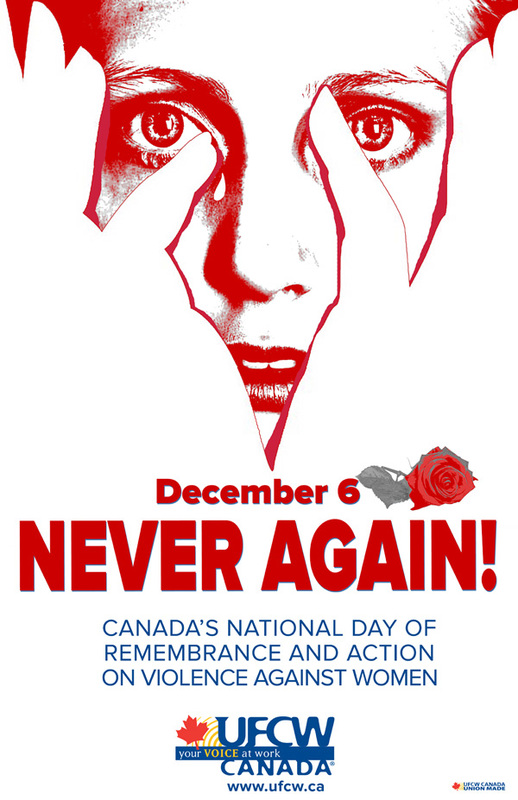 This December 6, activists are encouraged to attend December 6 vigils taking place in communities around the country, and to support YWCA Canada’s #NotOkay and Rose campaigns to help further eliminate gender-based violence. UFCW Canada has also launched a campaign demanding paid leave, reasonable unpaid leave, and options for flexible work arrangements for victims of domestic violence. Please take a minute to send a message urging your provincial government to make paid leave a reality for domestic violence survivors. Each step we take together, with the strength and solidarity bestowed upon us as union members, is important in the small-scale and large-scale work needed to end violence against women and girls in Canada.